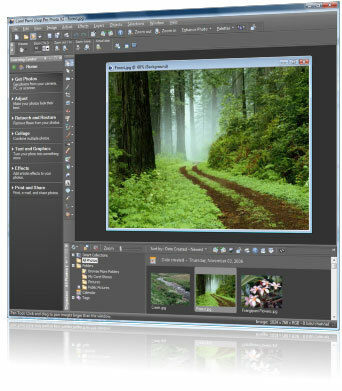 Corel Paint Shop Pro Photo X2 Ultimate combines ease of use with full professional power. Fix brightness, color and photo imperfections like red eye in a few clicks, or use precision photo-editing controls to create photos you'll be proud to share. The Ultimate edition features valuable extras like media recovery software, a creative content pack, Corel Painter Photo Essentials 4 and a 2 GB USB flash drive--over $180 in value! The easiest way to get professional looking photos--fast! Paint Shop Pro Photo X2 has everything you need to create stunning photos. The integrated Learning Center and a selection of one-click photo-fixing tools make it easy to correct common photo flaws such as red eye, color and sharpness. Unique makeover tools let you whiten teeth, remove blemishes and paint on a tan, so you can make everyone look their best before printing or posting photos online. As your skills and confidence grow, you can harness the power of professional-quality features such as HDR Photo Merge, Histogram, Curves and Levels Adjustment tools to make precision edits. You can even get creative with artistic effects and filters to turn your favorite photos into fun projects to share with family and friends. The Express Lab lets you edit photos without opening each image file individually, so your workflow runs seamlessly. Click to enlarge. Use layers to add effects to your images. Click to enlarge. Ease of use with full professional power. Click to enlarge. For those who shoot in raw format, support for over 250 cameras has been added. This new plug-in lets you easily change the background in your photos to create unique and exciting effects. Just cut out part of an image, remove it from the background and place it on a different setting. You can even preserve fine image details like strands of hair or smoke. Ideal for scrapbooking and other creative photo projects, this bonus pack contains 150 brand-new, custom-made photo frames, photo edges and Picture Tubes that allow you to enhance any image with fun graphics. Certified for Windows Vista software has undergone Microsoft compatibility tests for ease of use, better performance and enhanced security. 1. Choose a photo and the painting style you want to apply. 2. Let the Smart Stroke painting technology create a stunning painting. 3. Touch up your masterpiece by hand if desired. New Media Recovery software included with Paint Shop Pro X2 Ultimate can recover images, movies and sound files from memory cards, even if they have been reformatted. It is compatible with virtually all media card formats, including SD, miniSD, microSD, CompactFlash I & II, Memory Stick, MMC, xD, SmartMedia and Micro Drive. Paint Shop Pro Photo X2 Ultimate comes with a 2 GB USB flash drive for storing and transferring your digital photos and files. This fast, fun and easy photo & video software lets you turn pictures and video clips into slide shows, and create collages, calendars and album pages. Get photos from your PC, camera or scanner automatically with Express Lab. Click to enlarge. 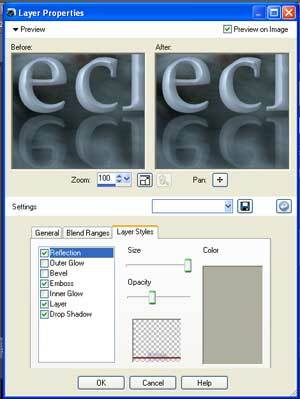 Easily apply artistic effects to individual layers, such as drop shadows, embossing and reflections. Click to enlarge. Merge photos of the same scene taken at different exposures or with different brightness/contract settings to create a final image that features the full range of detail in the highlights and the shadows. Click to enlarge. This easy photo fixing mode helps you view and correct dozens of photos in the time it used to take to edit just a few. The Express Lab lets you edit photos without opening each image file individually, so your workflow runs seamlessly! Automatically store a copy of your original photo when saving an edited version. Quickly separate multiple images that you scanned at the same time. This tool automatically creates a new file from the cropped area and keeps the original scan open so you can easily separate individual image files from the group scan. 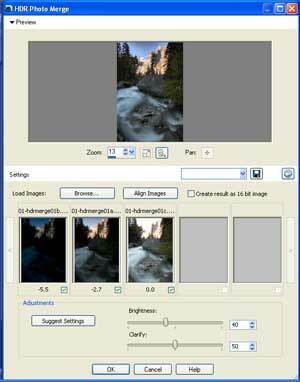 Download photos from your camera to computer effortlessly, including raw image formats produced by many digital cameras. By working with these "digital negatives," you can achieve the results you want with greater artistic control and flexibility, without overwriting the original raw files. View photos and video clips in more than 50 file formats. 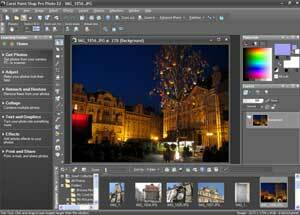 Easily import files and ensure accurate color quality for your images. Email photos or slide shows to family and friends. Make sure the people in your photos look their best with tools that are fun and easy to use. Help your subjects look thinner in seconds, whiten bloodshot eyes, smooth wrinkles, paint on a tan and remove blemishes. Instantly correct lighting and color problems with automated tools, or make manual corrections on your own. Eliminate red eye in one click or use advanced red-eye removal that even works on pets. Easily change the color of objects in your digital photos, such as clothing, walls and furniture. Rather than simply replacing a color, the Color Changer detects and analyzes variations in brightness, then makes the necessary adjustments to produce a realistic effect. "Noise" artifacts are small specks of color that interfere with the clarity of your digital image. Fix crooked photos taken at awkward angles. Get rid of unwanted distortions by changing perspective. Restore old, damaged photos by removing scratches and fading. Improve photos by covering up unwanted background objects, such as lamp posts, trees and buildings. Merge photos of the same scene taken at different exposures or with different brightness/contract settings to create a final image that features the full range of detail in the highlights and the shadows. Create dynamic black & white images by simulating the look of taking photos using a colored lens filter. Maintain image quality when applying changes to color or tone. Edit photos with precision by adding multiple adjustment layers to test various color corrections or to see how corrections look when they're combined. 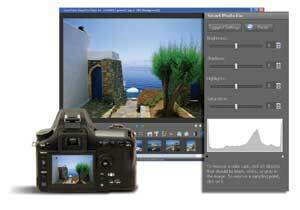 Change photo exposure using advanced features, including Levels, Curves or Histogram Adjustment tools. Turn fuzzy photos into crisp images, without compressing or degrading the quality of the image. Easily remove fish-eye, barrel and other lens distortions. Draw attention to a specific area of an image. Depth of Field applies focus to a region of your photo while applying an out-of-focus blur to the rest of the image. This allows you to create an effect in seconds that usually requires precise manual lens aperture adjustments. Work with a variety of advanced features, including 16-bits-per-channel editing, color management settings and raw file conversion. Take credit for your photos by easily adding a visible watermark to label your work. Easily apply artistic effects to individual layers, such as drop shadows, embossing and reflections. Decorate your photos with 30 new sets of professionally designed artistic elements. A longtime user favorite, this tool lets you paint on photos with readymade art that features a variety of themes. For example, add butterflies and beetles to a picnic setting or fill an aquarium with fish. Easily add eye-catching final touches to your images with 20 new Picture Frames. A variety of styles and the ability to edit give you more creative possibilities. Go back in time and give photos a retro look using effects that replicate the unique appearance of photos taken in the 1800s, 1950s and other points in history. Easily covert your color photos to black & white, mimic infrared film or add a touch of class by making them sepia-toned. Produce interesting, eye-catching photos with a range of effects inspired by classic film and filter types. Simulate the unique look of slide or portrait film, mimic the effect of using color filters on your camera lens, or apply a Film Look to model the effect of using different types of film in a traditional camera. Add shapes or words to your photos to add creativity, raise impact, or note important dates and events. This bonus pack contains 150 brand-new, custom-made photo frames, photo edges and Picture Tubes that allow you to brighten up any image with fun graphics. It is now well over a month and still I have not received the product!! It qualified for free shipping, but I needed sooner so I paid Amazon extra $$ for expedited shipping and never received anything. I requested a refund and Amazon sent return postage tag, yet I still have NO merchandise to affix it to? This is very poor service on Amazons behalf. I do not think I will EVER purchase from them again!! I have been negligent in reviewing the Corel Paint Shop Pro Photo X2 Ultimate image editing program because I wanted to be sure about what I suspected when I began using it a couple of months ago. 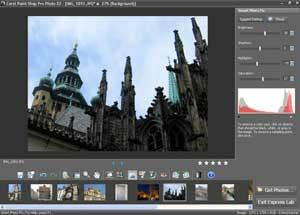 "This program is better in many ways and cheaper than the top rated Adobe Photoshop Elements version 7." I was reluctant to believe that hunch at first. I have both programs installed on a VISTA laptop. Both installed easily and without problem. Both function perfectly without any of the crashing and buggy performance described by other reviewers. I have been using the two programs interchangeably for awhile and eventually noticed that I was opening and using the Corel Paint Shop Pro program more often than the Adobe software. That was the prompt that I needed to offer this review, but my observations do not intend to say the Adobe Photoshop Elements program is necessarily inferior--I simply prefer the Corel software and find it less complicated to use. I will attempt to tell you why. First, the Corel home screen is easier to see. I found the Adobe Photoshop Elements screen sort of dark and foreboding. The two screens are similar in how the toolbars and menu items are arranged, but not all that much alike in how they are applied. I think the Corel program is more intuitive and logical than the Adobe system. Both programs have all of the usual features like red eye removal, cropping, brightness adjustments and cloning. These are mostly straight forward, but the Corel program strikes me as less complicated in these areas than the Adobe. I should admit at the onset--I have yet to master the "Layers" functions in either program. Be that as it may, I am pretty familiar with the rest of the tasks offered by both programs. Adding images to the organizer pallet at the bottom of the main Corel window is a snap. The "saving as a copy" option in the Corel program is very helpful. Image color adjustments can be made in a number of ways in both programs, but Corel Paint Shop offers better options for changing hue, saturation and texture. I was happy to find how easily edits can be reversed with undo opportunities along the way. The image straightening and adjusting perspective features are worthy of note as is the skin smoothing and tooth whitening options. There is even an option in the Corel program to make a person appear thinner. I never thought I would use that tooth whitening thing, but I have. I found the Corel feature called "Browse effects" to be particularly useful because it brings up a familiar outline style listing of everything the program does all in one place. One doesn't need to click around on various icons and menu items in order to find the function desired. Clicking through this "Browse effects" list brings up thumbnails that illustrate the choices involved. One could almost use this feature and ignore the array of icons and menus situated around the main window. I have used the Corel "time machine" function a few times to give vintage appearances to certain photos and find it to be fun if nothing else. The same is true for the frames and distort features along several other artistic effect functions that I doubt most people would use very often. The reason I mention these options is to point out the presence of several functions that are really just amusing to use and probably not essential to serious photo editing. The ability to adjust the appearance of the home window in the Corel program is appreciated, but I have not messed with that at all. I like the looks of it as is. If you are trying to decide which program to buy and think the Adobe Photo Shop Elements program is definitely number one you should certainly consider the Corel alternative. 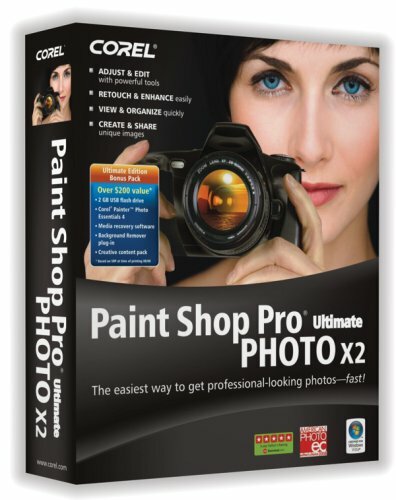 I would recommend you buy the Corel Paint Shop Pro Photo X2 Ultimate instead of the Adobe Photoshop Elements program Version 7 not because they are so different in what they do, but because they are so similar in almost everything else except the price and ease of use. 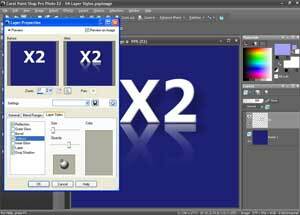 The Corel Paint Shop software is easier to figure out and it is significantly less costly than the Adobe program. Then of course there is the matter of how I found myself using the Corel program more often than the Adobe program. I think that says something. I uses Photoshop CS 2 before and while this is a phantastic software for editing pictures, it was really shooting birds with canons. The most pictures I make these days fall in the category of family snapshots, with the occasional landscape and some other documentary photos. So I was looking for a more simple solution with more automation / with three kids, you just don't have the time anymore to individually tweak every photo to the max in PS. And with my wife discovering the joy of taking pictures of our kids, the picture count for this year is slightly below 3000. X2 Ultimate has everything that I need - a quick fix button for my wife, a somewhat more elaborate but still simple tweaking capability for me and if I really need it, it also has basically the same functionalities built in as PS, when you delve deeper into the menus. It also has a decent photo viewer and comes will all kinds of bells and whistles that I haven't tried out so far (like the background removal tool, the HDR fuction etc.). The worklflow might not be as refined as with PS and Lightroom, but for my basic and simple needs it is a perfect fit. The learning curve is practically non-existent if you already have some experience with other photo editing software. And it runs very fast even on my old XP machine with 1GB RAM. Learn how to edit your registry! Corel has taken a very good product, Paint Shop Pro, and turned it into junk that won't run or even let you remove it without manually terminating the processes it runs in the background. After it seemed to run fine, on day 32 (possibly 31, as it wasn't run that day) it ceased to operate at all. This was a fully licensed copy, not a trial. So their return system won't even respond since it's over 30 days old - good timer they have. This is a great product, especially for folks on a budget. I use Photoshop at work; I'm finding that Paint Shop Pro Ultimate Photo X2 does lots of the things that Numero Uno does - and I have just begun exploring it!